The majority of whites in then Rhodesia supported this audacious bid. The vast majority of blacks, coloureds and Indians did not. The absolutely predictable subsequent failure of UDI and calm reflection over the last 50 years should have induced a general consensus among Rhodesians/Zimbabweans that, at least with the benefit of hindsight, UDI was no more, no less, an act of irresponsible folly. It was a guaranteed failure that cost the lives of thousands, causing human misery on a pandemic scale that is with us to this very day. Alas, that is not the case, with a huge chunk of mainly white ex-Rhodesians who not only lament the failure of UDI, but also postulate Smith’s Rhodesia as having been a world-beating haven for humanity and Smith as one of the greatest heroes of the modern age. In addition, Smith penned two books in which he proffers much justification for the adoration that he is accorded by some. So what is the truth about Smith? There is this quote veritas oratio simplex est, that is, the truth is ever simple. Sometimes truth is not simple. Fortunately, as regards Smith, it actually could not be simpler. I was there, at every step of these events. This ended with a conversation I had with Smith at the Harare Agricultural Show, in about 1987, where he correctly predicted that President Robert Mugabe’s government would ruin the country completely as “these commie chaps love no one but themselves”. This is the first claim made by his fans. Romantic nostalgia about Rhodesia on social media is now pathological. All the “good” that Rhodesia had is attributed to Smith. The simple reality, however, is that Rhodesia’s greatness (ignoring its systemic oppression) being its outstanding development, resource and infrastructure management, had virtually nothing to do with Smith. The country had been developed by his predecessors and he actually did nothing, but plunge it into an unwinnable war that ensured that it started to slide into the mess that it is in today. It all started with him being warned that the country would be sanctioned if he declared UDI. He declared UDI and it was sanctioned. The effects were devastating. You were king if you had a packet of Smarties and cigarette lighters had to be refilled manually, just for a start. The fantastic progress that the country had hitherto enjoyed under his predecessors was stopped in its tracks, never to recover. Smith had no option but UDI? Smith’s Rhodesian Front government was the legal administration of the colony and constitutionally guaranteed non-interference by Great Britain. Indeed, Britain had never interfered and was not threatening to do so. So Smith could have pursued his professed agenda of stopping “communist rule” without rendering his government illegal if, of course, that agenda was honourable or underpinned by good faith that is. It conferred a duty on all countries, as signatories to the UDHR, to take measures to remove his government.As will be seen below, it was quite unnecessary for Smith to declare UDI if his intentions were genuine. By declaring UDI he instantly converted a very good country into a pariah state. Why? What powers did the Smith have? This one is critical. In 1923 the Rhodesia was granted “full self-government” status with only one reservation. That reservation was that it could not pass laws that affected Africans without British government consent. That was the only reservation. In all other respects the Rhodesian government had all the powers that any government on the planet had. So it is an obvious deduction that the only other power that UDI could have conferred on the Smith government was the freedom to enact laws that affected the African majority. Period! Note that not only had the British government not ever interfered, it had actually been complicit in permitting the passing of oppressive legislation such as the Land Apportionment Act. But, as we shall see, 1948 brought a paradigm change to all that. What they were told was that a successful UDI was needed to prevent a communist-inspired takeover of Rhodesia with the resultant loss of their British/Rhodesian roots, heritage and way of life. The world was indeed in the throes of what was known as the Cold War and Smith extracted maximum political mileage out of this. The dreadful reality was that his UDI actually embarrassed the West, during the Cold War, and conferred an absolute right on the Communist bloc to take advantage of the situation, which it did with understandable enthusiasm. Had he not declared UDI, Britain in particular, would have had no option but to prevent communist intrusion into the domestic affairs of the country. He, more or less, made this all too clear, ie to prevent majority rule in his lifetime. Of course, he justified this on the basis that the majority was communist-inspired, because the Communist bloc had started arming the then sprinkling of African freedom fighters. “Let me say it again. I don’t believe in black majority rule ever in Rhodesia — not in a thousand years. I repeat that I believe in blacks and whites working together. If one day it is white and the next day it is black, I believe we have failed and it will be a disaster for Rhodesia.” — per WikiQuote. Smith had won the election of November 1962 on an election platform that was predicated on the notion that the then United Federal Party (UFP)’s roadmap to majority rule, called “Partnership”, was a communist-inspired “sellout” strategy to deliver the country to incompetent African communists. His was the equivalent of South Africa’s swaart gevaar, that is the blacks will get your house, job and daughter. It was understandable that the white electorate were susceptible to this, given the then failures of some African governments and the aggression of the Communist bloc. The reality was that the previous UFP had been on a roadmap to competent majority rule in continual negotiations with the then father of black nationalism, Joshua Mqabuko Nkomo, in particular, who was about as “communist” as George Bush. In terms of the UFP’s roadmap non-whites, like myself, were recruited into the civil service, sent on “Adventure into Citizenship” programmes so as to ensure competence and race/ethnic unity in the advent of majority rule. The only tension between the UFP government, Joshua Nkomo (leader of Zapu) and Ndabaningi Sithole (leader of Zanu) was the pace of this change. Smith stopped all that and no blacks were recruited to meaningful posts in the civil service for over 10 years thereafter. That is how, in 1973, I became the first and only non-white judicial officer. The problem with his agenda? There could not have been a more fundamental and resolutive problem with his agenda. In 1948, the whole world had signed off on the UDHR, after two bloody world wars and the Holocaust. There was simply no basis on which the world could now tolerate minority rule. Such rule violates any number of sacred articles of the UDHR. The UDHR, in effect, guaranteed the end of all colonialist and minority governments and former British Prime Minister (1957-1963) Harold Macmillan told the South African parliament as much in his famous Winds of Change speech of 1960. It was for this reason that on June 12 1962 the United Nations passed a resolution that Southern Rhodesia constituted a “Non-Self-Governing-Territory under Chapter XI of its Charter”. Ironically, it was the diabolical machinations of Adolph Hitler that induced the world to abandon the hitherto “might is right” culture that had subsisted from time immemorial and had driven colonialism. It is important to realise that this finding by the UN, in effect, precluded any country from recognising a minority government in Rhodesia even if the British government had granted this to the Smith government. It is also pertinent to point out that Smith had actually fought in the heroic Battle of Britain to ensure that his own homeland of Great Britain was not subject to minority rule by Germany occupation. In the circumstances, Smith’s gross irresponsibility and foolishness could not be more stark. It was therefore not at all surprising that the very day after UDI the Security Council of the UN felt compelled to pass a resolution calling on all states not to recognise or provide any assistance to Smith’s “racist minority regime”. The UN really had no option. That was its perfectly predictable duty, and all sentient humans should have realised this at the time and certainly by now. Obviously the rest of the world regarded Smith and his regime as racist because of his obsession with minority rule. However, the real question is this: was Smith personally possessed by a deep-seated racist culture and ethos? I have been astounded at how just about everybody has missed this fundamental issue about Smith. The proof is in the pudding, as they say, and the proof emerged with blinding clarity when he got minister Mark Partridge to table a Bill titled the Residential Owners (Property) Protection Bill, (Pop Bill) and/or Residential Owners (Property Protection) Bill of 1967. This was augmented by the Municipal Amendment Act. These were his versions of then South Africa’s infamous Group Areas Act that guaranteed the separation of people on race and ethnic lines because non-whites were considered as inferior and de facto contaminants in semi-human form. Nothing could have been more racist. What stopped Smith in his tracks was that the Jewish Community joined hands with the coloured community at the most successful event staged at the Arcadia Coloured Community Centre and gave Smith notice that this racism would be fought “tooth and nail”. Given that his regime was already under pressure on all other fronts, Smith dared not lose the support of the powerful Jewish Community, especially as many in his camp imagined that ever beleaguered Israel would eventually come on side. The Portuguese, Chinese and Greek Communities also lent support in large measure despite the efforts of Kiki Divaris, who came out all guns blazing in support of this racist legislation. This good lady later became a darling of the tyrannical Mugabe regime. Res ipsa loquitur (facts speak for themselves) — Smith was a racist at heart. No question about that. So it is obvious that his agenda and UDI had everything to do with ridding himself of the British veto on racist legislation and little to do with “preserving civilisation and preventing a communist takeover” for the very simple reason that he did not need UDI in order to fight on these fronts. How did he manage to fool so many? Thirdly, Smith used the tried and tested “mushroom techniques; where you keep them in the dark and feed them on lies”. To this end he introduced censorship of the news media and this was carried out ruthlessly. As a result, it soon became normal for the newspapers to appear with blank white spaces representing the handiwork of Smith’s censors who were actually installed full-time in these media houses. The idea here was to feed the electorate the storyline that there were just a few communist-inspired insurgents indulging in “terrorist incursions”, not supported by the black majority, and who would soon be knocked over. I can never forget the cognitive dissonance that set in when members of the judiciary were flown to the “sharp end” at Mt Darwin and briefed by Lieutenant-Colonel Derry MacIntyre, who informed us in chilling detail, that the country was actually involved in an unwinnable war (for both sides), not simple “terrorist incursions” and that he respected Zanla commander Josiah Tongogara as a masterful tactician. Fourthly, Smith was quite ruthless about suppressing dissent. The previous prime minister Sir Garfield Todd and his family were routinely persecuted “restricted and detained” so as to shut them up. This is well-documented in Judy Todd’s great book Through the Darkness. Restriction and detention was legalised under “state of emergency laws” and many sentient voices of protest and truth were silenced thereby. Sentient voices of the likes of Dr Ahrn Palley and Alan Savory were subject to vicious attack and vilification with the latter more or less being eventually forced into exile. People such as Herbert Foya Thompson and Frank Berman, actively involved in political organisations or those suspected of actively supporting the struggle for liberation, but did not commit any prosecutable crime under the Law and Order Maintenance Act, were detained as “saboteurs”, “agitators”, or “provocateurs”. Why are Rhodies still nostalgic? I imagine that the reason is to be found mainly in the cliché that humans never forget those that made them feel good about themselves. When I visited Germany for the first time, I found otherwise very sentient Germans who spoke nostalgically about Hitler. Both Smith and Hitler made their followers feel very good about themselves. Smith fired up “white nationalism” in Rhodesia just as Hitler fired up German nationalism. When this happens, an irrational herd mentality kicks in and everyone also gets entrapped by Carl Sagan’s bamboozle effect. Much mileage is made of the fact that the Mugabe government has proved to be a disaster for all, just as Smith predicted. The harsh reality is that it was Smith’s intransigence that guaranteed the advent of Mugabe’s government. Of this he was warned ad nauseam by many sentient voices. Mugabe was unknown in 1962, when Smith’s party came to power. Nkomo and Sithole were the leading African nationalists. For me, November 11 1965 — UDI declaration — was one of the saddest days of my life. What Smith did was the first step on a disastrous path that plagues us to this very day. 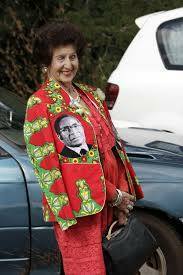 photo-Kiki Divaris models a jacket with President Mugabe’s potrait. This article was first published in the independant whilst Kiki Divaris was still alive.